Used Polycom phones. Refurbished Polycom RealPresence Trio phones, Polycom RealPresence Trio Phones. Sell buy refurbished Polycom telephones. 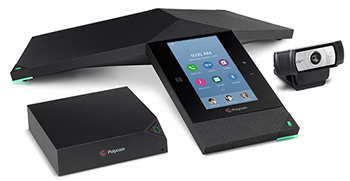 The Polycom RealPresence Trio conference phones and accessories is an IP-based conference system that supports high-quality voice conferencing through 3 built-in microphone with a range of 20'. It has a clear loudspeaker, HD Voice, acoustic clarity and noise block technologies.